PALO, Leyte – There is no contamination of Kananga River as a result of a landslide-induced busted steam pipeline of the Energy Development Corporation, the Environmental Management Bureau of the Department of Environment and Natural Resources in Eastern Visayas informed. EMB-8 Director Leticia Maceda disclosed that based on the initial analysis of the water taken from the Bao River in Kananga, Leyte, there was low concentration or tolerable amount of Boron. Director Maceda said that Boron is a chemical element said to be inherent in any water spring. Low presence of boron could serve as a nutrient to plants while its high concentration could lead to stunted growth. The amount of Boron is still below the acceptable standard in the country which is .75parts/million, Director Maceda said. The result of the sampling by the multi-partite monitoring team composed of various government agencies showed that the presence of Boron in the river was only .22 parts/million. It was learned that for its part, the EDC also conducted its own analysis on the presence of Boron in the river which yielded the result of .25 parts/million. Maceda, however, said that the office submitted the water sample to an independent Manila-based Austria Laboratory and is waiting for the result which is expected to arrive anytime. She expressed confidence that the result from the private lab would also yield a similar result. The March 1 landslide in Pad 409 Upper Mahiao, Barangay Lim-ao in Kananga has not only resulted to the death of 14 workers but also busted a steam pipe which several sectors expressed fear to have caused Boron to spread to the tributaries leading to the Bao River. The site of the incident was just about five kilometers away from Bao River, it was learned. Earlier, Kananga Mayor Elmer Codilla denied that there was water contamination due to the incident. CAMP SEC. KANGLEON, Palo, Leyte – A CAFGU Active Auxiliary and his two brothers who have been wanted by law for murder and frustrated murder charges were the latest addition to the list of wanted criminals captured in the intensified manhunt operations by the Police Regional Office 8. “This is a part of our ongoing operation against wanted criminals in line with the PNP’s Manhunt: Charlie,” said PRO8 director Chief Superintendent Elmer Ragadio Soria. Soria added that the accounting of wanted persons is an integral part of the security preparations for the forthcoming national and local elections to ensure the conduct of secure and fair electoral exercise in Eastern Visayas. The top police official informed that at about 9:20 A.M. last Thursday, Tracker Team from Calbayog City Police Station under Police Superintendent Elmer B. Cinco conducted manhunt operations at vicinity of Purok 6, Brgy Capoocan in Calbayog City resulting in the arrest of three brothers tagged as the three most wanted persons in Calbayog City. The regional director identified the suspects as Renato Marces alias Rene, 45, married, CAA member of 52nd Infantry Battalion, Philippine Army and his brothers Federico alias Pede, 50, married, carpenter and Dionesio alias Julie, 48, married, fisherman, all residents of Purok 2, Brgy Pilar, Oquendo District, Calbayog City and listed as Number One, Two and Three most wanted persons in Calbayog City respectively. The Marces brothers were arrested by virtue of an arrest warrant for Murder with Frustrated Murder in Criminal Case Number 6511 issued by Hon. Romeo G Tagra, Presiding Judge of Regional Trial Court Branch 32 in Calbayog City. No bail was recommended by Judge Tagra for the suspects’ temporary liberty and they are now detained at Calbayog City Police Station lock-up cell while awaiting trial for their cases. 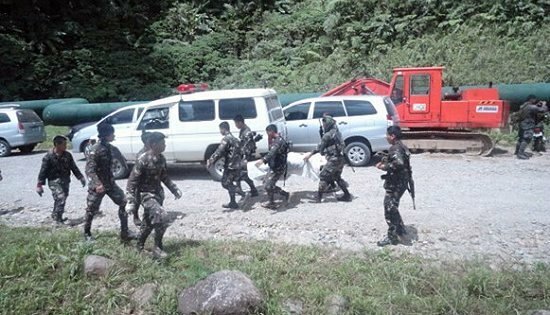 Meanwhile, the number 7 in the list of most wanted person of Matuguinao town in Samar was captured by joint elements of the Regional Special Operations Group 8 (RSOG8) and Special Operations Task Group - Samar (SOTG-Samar) in early Friday morning during a manhunt operation at the outskirts of Brgy. Nalihugan in Gandara, Samar. 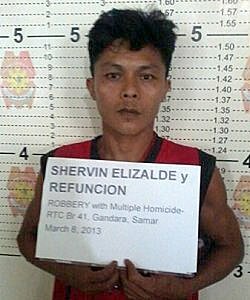 Shervin Elizalde y Refuncion, 32, single, a native of Matuguinao, Samar is one of the 6 suspects in the robbery and gruesome murder of brothers Jacinto and Nilo Micol along the trail towards Brgy Maduroto in Matuguinao, Samar that transpired in the afternoon of September 3, 2011. The joint police team led by Police Senior Inspector Shyril Tan and Police Inspector Constantino Jabonete, Jr. was armed with an Alias Warrant of Arrest against the suspect for the crime of Robbery with Multiple Murder issued on November 28, 2012 by Judge Feliciano Aguilar of Regional Trial Court Branch 41 in Gandara, Samar with no recommended bail bond. Elizalde is currently detained at Samar Sub-Provincial Jail in Calbayog City per commitment order issued by Judge Feliciano P. Aguilar on March 8. Soria added that continuing police operations would be mounted to account for more criminal offenders wanted by the law. TACLOBAN CITY – Construction of farm-to-market roads, provision of agricultural facilities compose the majority of projects identified by focus LGUs in the region under the Bottom-Up Planning and Budgeting approach for 2014. This, said Dir. Pedro A. Noval Jr., was the result of the consolidation done by the DILG-8 Local Government Productivity Enhancement through Teamwork (LGPET) Team # 2 and during the review by the Regional Poverty Reduction Action Team (RPRAT) led by the DILG last March 6-7 at the DILG-8 Regional Office in Tacloban City. “The RPRAT went over the projects identified in the Local Poverty Reduction Action Plans (LPRAPs) of LGU beneficiaries which are being proposed to be included in the budgets of national agencies involved in BUB for next year”, revealed Dir. Noval. He added that the group discussed among others, the steps to be observed when 1) a project prioritized by the LGU does not fall under the BUB menu of programs or does not correspond to the mandate of the agency it identified; 2) and the LGU projects exceed its budget cap. To address this, DILG has set a series of feedback sessions on March 11-16 at the DILG-8 Conference Hall for LGU beneficiaries whose LPRAPs needed revisions. There are 115 focus LGUs in Eastern Visayas for the BUB implementation in 2014. The LPRAPs are the result of workshops held per LGU which heavily involved the civil society. After being organized in their respective civil society assemblies, CSO members chose their representatives to compose one-half of the LPRAT prioritize the projects to be funded under the 2014 BUB. In Ormoc City, Mayor Eric Codilla led stakeholders in a workshop last February 4-5. In his message, Mayor Codilla emphasized that the LPRAT should also take into consideration “a plan that is realistic and doable given the funds allotted and within the given timeframe.” The group proposed projects relating to agriculture, tourism and livelihood programs, among others. Civil society and the local government of Naval, Biliran agreed on 13 priority projects to be implemented under BUB in 2014 as a result of separate workshops last January 18 and February 5 through the facilitation of MLGOO Jerry Enriquez. These included such livelihood projects as ampao, kaong and basket making and food processing; education transport vouchers to high school students; establishment of local registry of skilled workers; fishpens, mangrove reforestation, farm-to-market roads; and rehabilitation of irrigation system. In Cabucgayan, Biliran, the workshop that was led by provincial facilitator Enan Macasusi and participated by both department heads, NGA representatives and CSOs, agreed on giving priority to nine (9) projects, mostly concerning the development of livelihood for its citizens. In Tacloban City, the workshop was held on February 13 at the Local Governance Regional Resource Center, DILG Regional Office 08 and led by Mayor Alfred S. Romualdez himself. Atty. Darwin N. Bibar, DILG City Director said the workshop incorporated projects on livelihood, as a result of the CSO Assembly which was attended by 168 people last January 31 as well as proposals from the local government unit. Meanwhile, in Southern Leyte, representatives of youth, women, senior citizens, religious, livelihood, and parents sectors participated in the province-wide LPRAP workshops from February 11-14. They were selected from among 200 participants in the CSO assemblies last February 7-11. The ten (10) focus LGUs in Southern Leyte are expected to receive a total of 153 million pesos next year for the implementation of priority pro-poor projects identified by the LPRAT. In Jaro, Leyte, municipal officials and CSO participants led by Mayor Rolando Celebre and facilitated by MLGOO Cleo Palencia likewise proposed for several agricultural, livelihood and infrastructure projects. Once the LGU finishes working on the plan, the CSO representatives shall then affix their signatures for legislative approval. The Sanggunian may now endorse the plan for submission to the RPRAT review led by the DILG. Each municipality will receive at least 15 million pesos under the BUB, with capital towns and cities allotted a bit more. Projects are supposed to be aimed at poverty reduction, disaster risk reduction and climate change adaptation, tourism and economic development. TACLOBAN CITY – Officers and members of 60 recipient Agrarian Reform Beneficiary organizations trooped to the Department of Agrarian Reform Regional Office compound on March 7 in order to personally receive the P19 million worth of modern farm equipment from DAR Undersecretary Felix Perry Villanueva. The sudden downpour did not stop the turn over rites as the visibly over joyed ARBOs signed the acceptance documents in front of USEC Villanueva, and Finance and Administrative Director Teresita Panlilio from the Central Office and DAR-Region 8 officials, Mr. Jose Alsmith Soria, DAR 8 Information head, informed. These farm implements according to USEC Villanueva, are given to identified ARBOs as capacity enhancement to the latter’s agricultural economic activities under the Agrarian Reform Communities Connectivity and Economic Support Services (ARCCESS). Tolosahay Upland Farmers Multi-Purpose Cooperative (TOFAMCO) Chairman Balbino Leona explained that with the new equipment given to their organization, land preparation and harvesting of rice would now be much faster and easier. TOFAMCO is one of the two recipients in the region of the P1.2 million combine harvester, which functions as harvester and thresher, Mr. Soria said. Mr. Balbino added that with these equipment, the organization expects to incur less expenses and earn more in their farm operations. DAR Regional Director Eliasem Castillo disclosed that there are 97 modern farm equipment worth P19.4 million given away to 60 ARBOs regionwide. These include 37 hand tractors; 30 threshers; 10 cultivators; eight water pumps; six flatbed driers; two reapers; two mechanical transplanters; and 2 combine harvesters. Among the economic activities of these ARBOs that get funding support under ARCCESS, Castillo added, are rice, organic vegetable, sugarcane and cassava production and marketing. DAR Regional Director Eliasem Castillo expressed optimism that with these equipment provided to them, the ARBOs will have higher yield from their awarded lots in the succeeding agricultural years. Eventually, the ARBOs will hopefully have an increased income resulting to a better quality life thereby contributing to poverty reduction and employment generation in the rural areas under President Benigno Aquino’s 2011-2016 Philippine Development Plan, Director Castillo added. CAMP SEC. KANGLEON, Palo, Leyte – After years in hiding, the leader of a notorious criminal gang behind the series of highway robberies in Samar the past years was arrested by the Special Operations Task Group - Samar (SOTG-Samar) Tracker Team in a manhunt operation in Metro Manila recently. Jose Arvin Baculanlan, 31, a native of Basey, Samar, the leader of the Baculanlan robbery gang and listed as the second most wanted person in Samar was nabbed at the corner of 14th Avenue and Boni Serrano St. in Cubao, Quezon City around 4 p.m. on Monday. “With his arrest, all the robberies his group had carried out are deemed solved and his gang considered neutralized,” said Police Chief Superintendent Elmer Ragadio Soria, Regional Director of Police Regional Office 8. The Baculanlan gang was linked to a series of highway heists in Samar in the past years. Soria informed that a civilian informant led SOTG-Tracker Team under Police Chief Inspector Marben Ordonia to the suspect’s whereabouts. Baculanlan was arrested on the strength of arrest warrants issued by Regional Trial Court Branch 30 Judge Janet Cabalona and Judge Tarcelo Sabarre of same RTC for 2 counts of robbery and violation of Article 294 of the Revised Penal Code (robbery with violence or intimidation of person) with recommended bailbond of P100,000.00 for each case. The members of the robbery gang the suspect led were arrested in past police operations while others “have lied low for a while,” said Soria, adding that PRO8 is continuously tracking their whereabouts. Baculanlan is now detained at Quezon City Police District for proper disposition. PASAY CITY – "Now that the Commission on Elections (Comelec) has a quorum, it can now reverse the ruling on limiting advertising time to 120 minutes for TV and 180 minutes for radio." This was the statement of Senator Alan Cayetano today as President Benigno Aquino III announced the appointment of former Ambassador Macabangkit Lanto and Atty. Bernadette Sardillo as the new Comelec commissioners to replace former Commissioners Rene Sarmiento and Armando Veloso who both retired last February 2. The Senator had long been urging the Comelec to reconsider its ruling on the time limit for candidate advertisements, saying that the agency should democratize campaigning rather than put limits to it. The Senator said that limiting the advertising airtime, particularly for radio, deprives the masses of much-needed information about their candidates. "With 180 minutes for all radio stations nationwide, that means candidates only have four 30-second spots for 80 provinces. Considering that we would also need to allot a great percentage of the 180 minutes to national issues, how will we get our message to our voters in the provinces and our stand on local issues with that limited amount of time?" Cayetano questioned. Cayetano added that with media being the most effective and most cost-efficient way to inform voters about their candidates, the aim of lessening the spending of candidates by limiting or regulating air time is at the expense of lessening voters’ opportunities to know their candidates more in order to vote wisely. "I am not merely pushing for more leeway for candidates to advertise themselves during the campaign, I am fighting for the right of the people to be informed and to make the right choice when they vote. I am pushing for a more mature system of elections where in leveling the playing field means we focus more on enhancing people participation rather than increasing regulations," Cayetano stressed. Cayetano also said that instead of focusing on limiting advertising time, the Comelec should focus on monitoring candidates' campaign spending and the source of the funds used to advertise. "Maraming mga taong gumagamit ng pera na pang-advertise na nagmula sa illegal na paraan – sa gambling, smuggling, etc.," Cayetano said. "Kahit na hindi lahat ng kandidato ay ganito, ito ang dapat tutukan ng Comelec imbis na airtime." "I understand the Comelec wants candidates to limit spending in order to level the playing field. But that is not what is happening on the ground. Instead of spending on a 30-second ad, candidates will instead spend on sorties where you have to purchase tickets for all your staff and yourself, to book a hotel and to find transportation in the area. This actually costs more,” Cayetano explained. During an earlier joint congressional oversight committee hearing on the automated election system (JCOC-AES), Cayetano had already expressed dismay over Comelec Resolution 9615 that limits national candidates to only 120 minutes of airtime for television and 180 minutes for radio during the campaign period. Meanwhile, local candidates are only allowed 60 minutes for television and 90 minutes for radio. In the past, the agency limited advertisements on a per-station basis. MANILA – More than a hundred children and child rights advocates from civil society organizations and government agencies trooped to the Commission on Elections (COMELEC) office in Intramuros, Manila today, March 7, and challenged aspiring political leaders to improve the status of the children in the country. 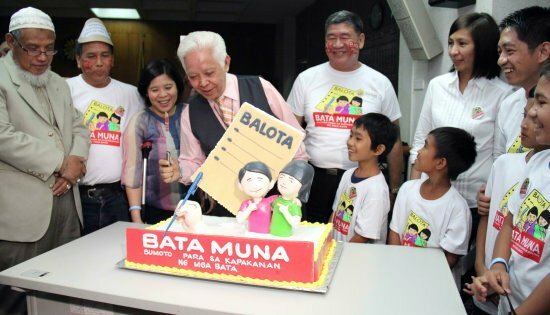 The campaign, “Bata Muna: Bomoto Para sa Kapakanan ng Kabataan” launched with a birthday party theme is forward looking as the group is hopeful to celebrate a new batch of political leaders who will improve the status of children in the country. Initiated by Save the Children together with Samahan ng Mamamayan - Zone One Tondo Organization (ZOTO) and children’s organizations leading the Children Talk to Talk (C2C) About the UN Convention on the Rights of Children Project, “Bata Muna” campaign is now joined by 22 other organizations around the country. “We are expecting more organizations and individuals to join us,” said Deborah Carmina Sarmiento, Policy Advocacy Manager of Save the Children. “Bata Muna now involves 25 organizations. These organizations are reaching and directly serving over a million children across the country,” she added. According to Save the Children, “Bata Muna” campaign wants political leaders who will stand up for children’s rights, voters to demand for political accountability on children’s rights, make children’s issues visible during the campaign time and ultimately influence voters to consider children when voting. Among other children’s rights issues, the campaign calls for a stricter implementation of the law against child trafficking under the recently enacted Expanded Anti-Trafficking in Persons Act of 2012. Figures from the Department of Social Welfare and Development (DSWD) reveal that from January 2003 to September 2012, 23% of the trafficked victims in the Philippines are children, of which 85% are girls. Among the factors that contribute to child trafficking in the Philippines are poverty, low economic development in the communities of origin, lack of education and skills for better economic options, limited employment opportunities, inadequate awareness among families, and gender inequalities. “Until now, children still fall into the traps of traffickers. The anti-trafficking law notwithstanding, its impact on the children still relies on its strict implementation,” said Marilen Soliman, Regional Coordinator of Asia ACTs. Asia ACTs is a regional network of organizations working together to protect all children in Southeast Asia from exploitation and abuse. Despite laws and policies that are already in place, the National Statistical Coordination Board (NSCB) states that children and women remain to be two of the poorest basic sectors of Philippine society with a poverty incidence of 34.8% and 25.1%, respectively. Meanwhile, the Mindanao Action Group for Children’s Rights and Protection (MAGCRP), a network of child-rights advocates working in collaboration with the Provincial Government of North Cotabato, calls on aspiring leaders to really look into the situation of children around the country. In Mindanao for example, thousands of children are displaced because of armed conflict and emergencies, most recently Typhoon Pablo, which severely hit poor provinces of Davao Oriental and Compostela Valley. At least 40% of the six million affected by Typhoon Pablo are children. Also, children in rural areas work in mining operations and commercial plantations while children in urban areas fall victims to trafficking, sexual abuse and prostitution. “Government’s social services hardly reach children especially those who belong to Lumads and Moro families in far-flung areas. Registration of children in these communities is still a problem,” said Chris Peñales of FPOP-SOCCKSKSARGEN Chapter, lead agency of MAGCRP. “Tomorrow, March 8, the Philippines along with the rest of the world is going to commemorate International Women’s Day. This is also a time to take notice of issues affecting young girls, such as sexual abuse, teenage pregnancy, trafficking and prostitution. This is one aspect of the many children’s issues that candidates can include in their agenda,” shared Sarmiento. “Beyond our campaign to put forward children issues during the elections, the Bata Muna will continue campaigning to hold those who will be elected accountable. They must deliver programs and policies that will improve the situation of children in the country. Enough of campaign promises that remains to be just that – promises,” ended Sarmiento. CAMP SEC. KANGLEON, Palo, Leyte – A man believed to be responsible in thievery incidents victimizing fresh fish dealers in Catbalogan City was arrested by the Regional Special Operations Group 8 (RSOG8) on Wednesday morning. 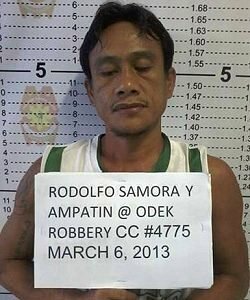 Eastern Visayas top cop Police Chief Superintendent Elmer Ragadio Soria of Police Regional Office 8 (PRO8) identified the suspect as one Rodolfo Samora y Ampatin, also known as Odek, 40, single, “baggage carrier” and a resident of Purok 2, Brgy. Guindapunan, Catbalogan City. “Stall holders at Pier I site have been complaining about losing their items to thieves. With the suspect and his cohorts’ arrest, these incidents would be stopped,” Soria said. Fishermen from coastal and island villages who catch fish and other marine products at Maqueda Bay, Samar’s premier fishing area, usually supply their products to fresh fish dealers who have stalls along Pier I site in Catbalogan City. Fresh fish dealers either retail it at the public market or transport it to Navotas Fish port in Metro Manila. RSOG led by Police Inspector Constantino Jabonete, Jr. arrested Zamora by virtue of an arrest warrant for Robbery issued by Judge Sibanah E. Usman of Regional Trial Court Branch 28, Catbalogan City docketed under criminal case number 4775. Judge Usman recommended a bailbond of P40,000.00 for Zamora’s temporary liberty. Zamora, his younger brother Romulo, and one Greg Metre allegedly ransacked a stall in said area and carted away 2 styrofoams of fresh prawns or lukon and other items some months back. The police regional director said that the suspect will be joining his brother Romulo and Metre, who were earlier arrested by the police, at the Catbalogan police station lock-up cell.